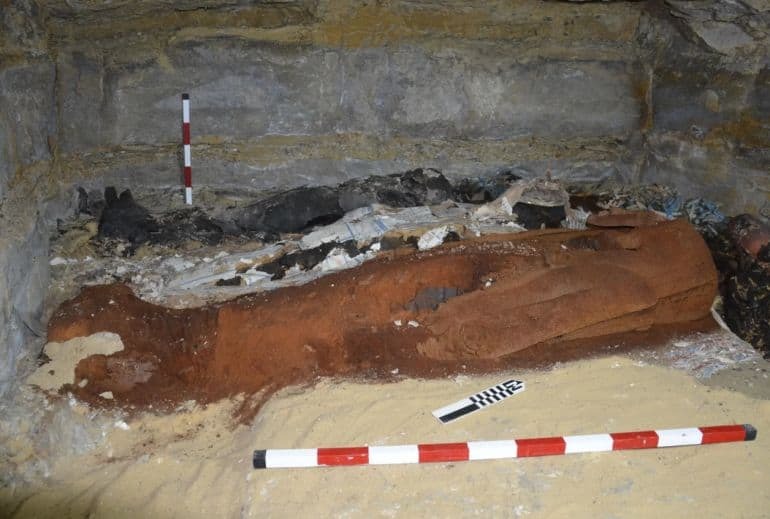 Since 2016, a group of researchers at the University of Tübingen have been excavating a major burial complex (necropolis) in Saqqara, Egypt. And this time around, their extensive efforts have yielded the discovery of an incredible artifact in the form of a gilded mask. 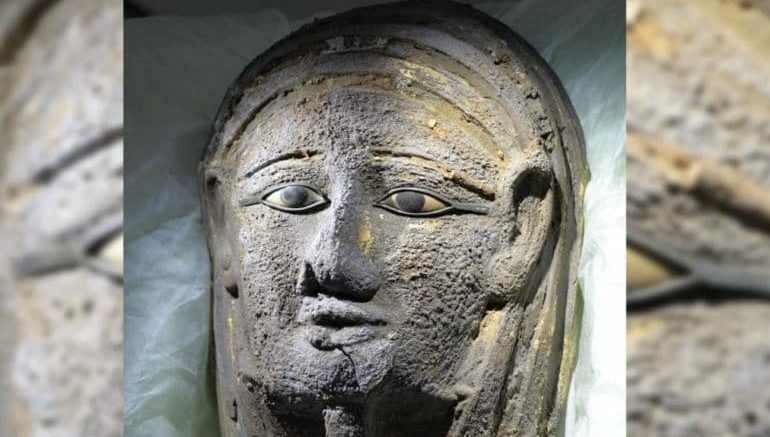 Preliminary analysis has revealed how the object probably dates from Saite-Persian period (circa 664-404 BC), while microscopic examination (conducted at the Egyptian Museum in Cairo) has shown that the mask is made of gilded silver and its eyes are inlaid with calcite, obsidian, and possibly onyx (or some related black hued gemstone). 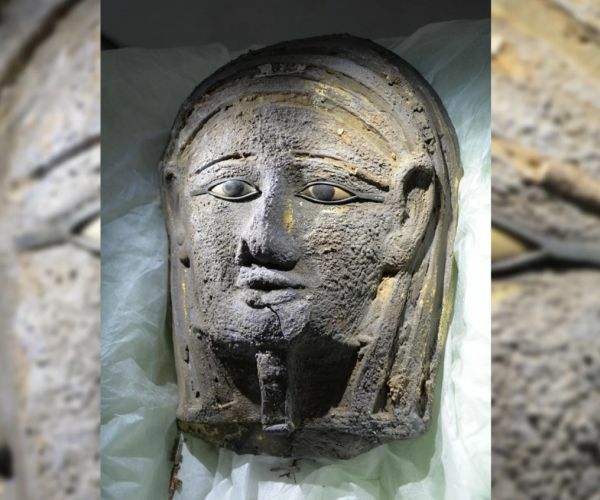 The mask was found placed on the face of mummy placed inside a partially damaged wooden coffin. Fortunately enough, in spite of its dilapidated physical state, the coffin through its iconography and labels directly points to its original male occupant. To that end, the compartment, according to the archaeologists, had once been plastered and painted with a depiction of the goddess Nut, while also containing the legible details (like name and title) of the mask’s deceased owner. The finding of this mask could be called a sensation. Very few masks of precious metal have been preserved to the present day, because the tombs of most Ancient Egyptian dignitaries were looted in ancient times. In it [mummification chamber] they found two large basins which they believed were used for the natron to dry the body and in the preparation of the linen bandages to wrap it. Pots found in an underground chamber included bowls and measuring cups inscribed with the names of oils and other substances used in mummification. The mummification workshop also has a large shaft in the middle, which was used as a communal burial place. It uniquely has several burial chambers, including a complex of burial chambers cut into the bedrock at a depth of 30m. Several burials were undisturbed. The archaeologists found not only mummies and sarcophagi; a large number of faience shawabti figurines were also found, along with alabaster vessels to hold the organs of the mummified person. Lastly, as we fleetingly mentioned before, in spite of the labyrinthine nature of the Saqqara necropolis with its underground ‘branches’ of shaft tombs, the archaeologists were able to make fair progress in their excavation efforts at the site. Part of that had to do with their use of advanced techniques like laser scanning and image-based 3D processing – which makes it possible to visually reconstruct the plan and layout of the various interconnected sections of the massive ancient Egyptian complex.